Create eye-catching jewelry or hand-embellished fashions with these beautiful Clay Beads. Each assortment contains a unique variety of colors, intriguing textures, and artistic shapes. Each assortment includes a variety of shapes in sizes that range from ¼" – ¾" (although sizes can vary). The 8 oz assortment contains approximately 100–105 beads. 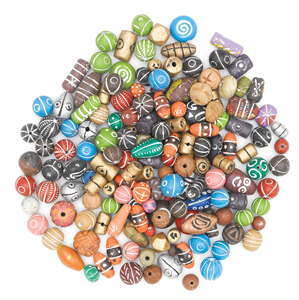 The 1 lb assortment contains approximately 200–210 beads.